I love it when other people tell me of new places to try. While at M and E’s bbq, A told me about a great meal she’d had in Mt. 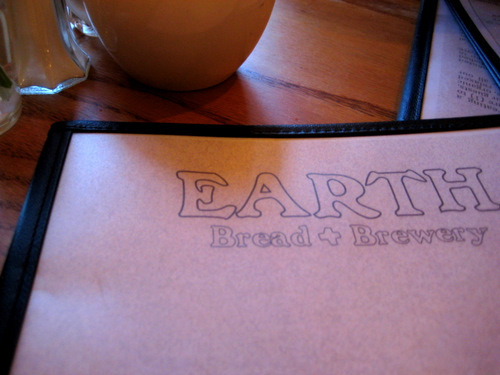 Airy to Earth Bread & Brewery. So we headed over there on a hot summer night. They make flatbread pizza here, and they also make their own beer. Pretty cool, right? It’s on a main strip in Mt. Airy, and it’s on two floors. It’s actually quite roomy. They have bars on both floors, and the wood fired stove is downstairs. It’s pretty cute. They have a number of their own brews, and they carry additional beers on draft. I tried the glutenus minimus, which is a gluten free beer! Weird, huh? Yes, definitely weird. But I really liked it. 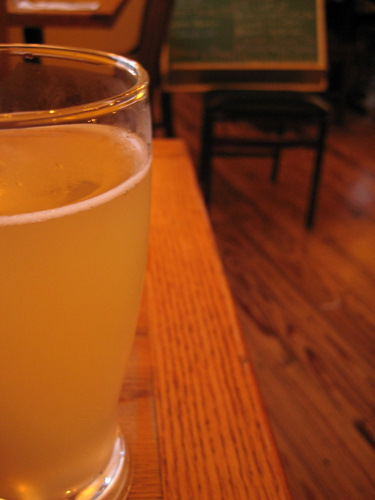 It was light, slightly citrusy, and a little bit sour. They also have more normal wheat based beers too. So don’t you worry. So let’s move onto the pizzas! J got a small White pizza. The small ones are a nice individual size. These are flatbread pizzas, so the crusts are thin. They’re made with king Arthur flour, and the dough is fermented long and cool for maximum flavor. Or at least that’s what their website says. 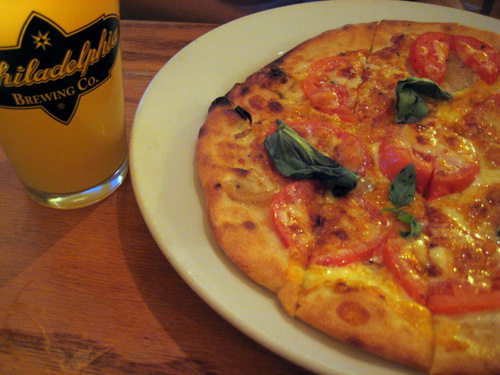 The white pizza has roasted garlic oil, mozzarella, jack, and fontina cheeses, roasted onion, plum tomato, and basil. The mozzarella is also made in-house. It was a very nice, light pizza. I went much more exotic and got the Molé pizza. It had spicy mexican chili sauce, roasted corn, black beans, blackened chicken, jack, and fontina cheeses. There’s obviously a lot going on with this pizza, but I liked it. 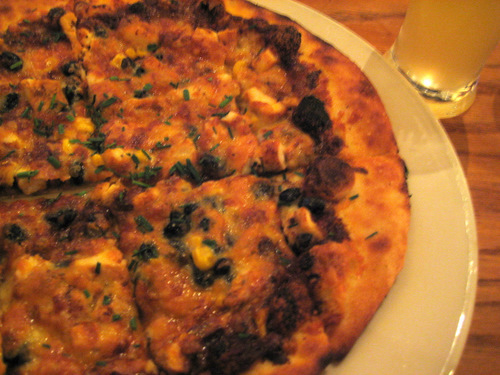 The beans and roasted corn were obviously very new to me, on a pizza, but for me, it totally worked. It was a like a burrito, on a pizza. Not a bad thing. We goth enjoyed our food, and our beer. The service, however, ouch. I cannot say anything good about it. It started off poorly, right away. When we got there, it said to please wait for the hostess to be seated. So we waited, and waited, and waited, and waited. It seriously seemed like forever. It turned out that the hostess was at the bar all along, the bar right behind the hostess stand, and just decided not to wait on us, until after 10 minutes of us standing in front of the hostess stand. She finally eventually decided to acknowledge us and took us upstairs and sat us. She gave us menus right away, shockingly enough, but then she didn’t bring us our waters until about another at least 5 minutes in. The server actually came over to us very quickly, but man, was she a sourpuss. She looked miserable, she sounded miserable, and was the least enthused person I’ve witnessed in a long time. Her level of disinterest in her job and her customers was through the freakin roof. Overall, we were both highly unimpressed with the service. I would even say that it sucked. Yeah, the service here sucked. It’s a shame, because the food and drinks were good!